Uranus is the loneliest thing in the solar system. It hasn’t had contact with anyone in over 30 years, since NASA’s Voyager 2 spacecraft whizzed by it on January 24th, 1986. Thankfully, some good folks at NASA and elsewhere are advocating for missions to Uranus and its Ice Giant companion, Neptune, which could take place at some point in the next few decades. The team’s 529-page-long report, released this month, elucidates the benefits of visiting these two woefully-understudied worlds. 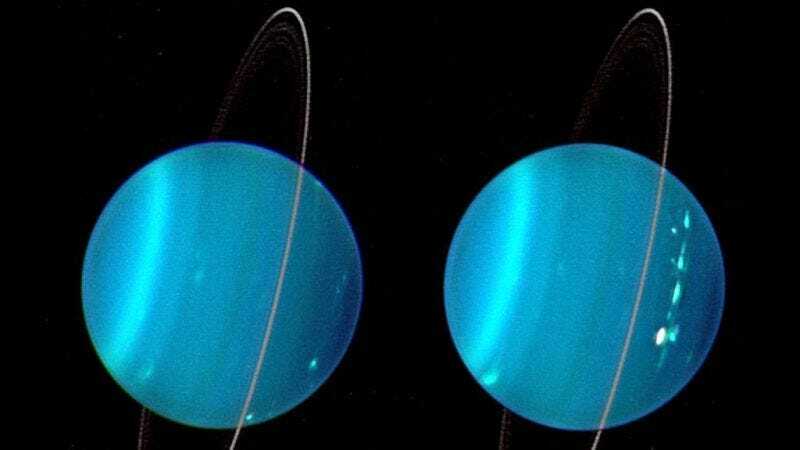 Neptune and Uranus, the so-called “ice giants,” are different from Jupiter and Saturn (the “gas giants”), in the sense that their mass is roughly 65% water and other ices, like methane and ammonia. Despite knowing so little about ice giants, the scientists behind the new mission study suggest these planets are incredibly common in our galaxy. A mission to either Neptune or Uranus could help us better understand exoplanets we haven’t found yet. Did we mention that Uranus and Neptune might be hiding vast oceans beneath their clouds? Because that seems like something worth looking into. This latest report from NASA outlines myriad potential mission designs, including, yes, a probe into Uranus. The team is particularly keen on sending both a probe — which would plunge into the planet’s atmosphere — and an orbiter that would hang out for several years, to at least one of the ice giants. Voyager 2 showed us so much about the ice giants that was previously unknown. It illuminated Neptune’s rings, a giant, ephemeral vortex called the “Great Dark Spot,” and geysers on its largest moon, Triton. The spacecraft also found 10 of Uranus’s 27 known moons, two new rings, and the planet’s lopsided magnetic field. Still, there’s so much left to learn about these weird worlds, such as what their interiors look like and what could have caused Uranus to have such an extreme spin axis that it basically rotates on its side. Maybe it’s just been really drunk all these years. The ice giant report will be considered as part of NASA’s Planetary Science Decadal Survey, which outlines the agency’s priorities for the next ten years — in this case, from 2022-2032. The next report will likely be published sometime in 2018. Until then, we wish the ice giants our best. The debris set off a fire that spread about 9.5 miles across.